Americans love the last weekend in May. For one thing, it’s a holiday, which means a day off. Banks are closed. Most offices shut down. Rush hours ease up. And unless you’re in the far reaches of the Yukon, it’s a pretty sure bet you can stow your mittens, snow boots and puffer coats until winter. Or at least late fall. BBQ Season has officially arrived. I dust off my famous baked bean recipe, which includes beans, bacon, catsup and brown sugar, plus a dash of cayenne, a splash of bourbon, and a few secret spices that will go with me to my grave. Grocers say sales of hot dogs are the second highest at Memorial Day. Only the Fourth of July beats it. You Can Get a Good Price on a New Mattress. No one knows why the best deals on mattresses are at Memorial Day (and also Presidents Day), but it’s true. If you want a new mattress to replace your old, lumpy, dust-mite-infested mattress, now is the time to do it. Mattresses used to last 20 years. They still do, but now mattress manufacturers encourage sleepers to replace their bedroom staple every eight years. This is just a guess, but I think it’s to sell more mattresses. The majority of Americans don’t mind a day off and when it comes in the form of a national holiday it’s even better because it might include a parade, a party and cupcakes, My cousin concocts an adult beverage called a Sneaky Pete that she serves during summer holidays, starting with Memorial Day. She won’t share the recipe. I’ve offered to exchange it for my baked bean recipe. It’s an exchange of equals because of the bourbon in my beans. She politely declines. Memorial Day Honors Military Men and Women Who Died in the Service of Our Country. I watched a man-in-the-street interview with a reporter who approached mall wanderers and asked if they knew why we have a holiday called Memorial Day. The responses were funny at first. Then preposterous. Then embarrassing. Then irritating. Wow. I never thought about it. Ummm. I don’t know. So we can sleep in and save gas driving to work. One guy got it right. He said to honor the soldiers who died serving our country. Bingo. We have a winner. My friend Joan sent me an email with pictures depicting Memorial Day celebrations. 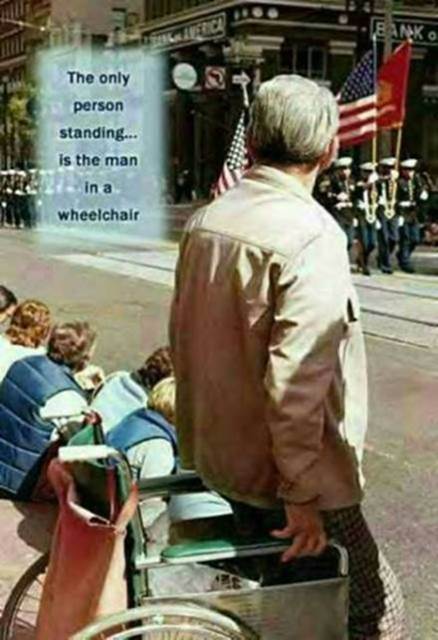 I was especially moved by the one taken at a parade that captured an older man standing in front of his wheelchair and watching the approach of the American flag. He was the only parade spectator who stood for the flag. When my Dad was alive, he never missed Jackson’s Memorial Day Parade. Wearing his ball cap that recognized WWII veterans, he’d watch the parade from near the steps of the Court House. The last year he was alive, my brother took him to the parade and he watched from his wheel chair. But when the Stars and Stripes passed by, my brother helped Dad to his feet so he, as a veteran, could salute the flag in honor of the fallen U.S. military heroes who gave up their lives to give us our freedom. Memorial Day is not a day about BBQs, mattresses, or sleeping in. It is a day of remembrance for Americans to honor those who paid for our freedom with their lives—even those who don’t know or don’t care. But especially for those who do.